One of the oldest cat breeds, the Turkish Angora originated sometime during the fourteen hundreds in Turkey. They are beautiful cats, and intelligent and interactive as well. Does your desire for a longhair pure breed cat lean toward beauty and grace, combined with smarts and playfulness? Then the strikingly beautiful Turkish Angora might just be for you. This breed is one of the oldest known cat breeds, once thought to be extinct. This is a natural breed, originating in the Fourteen-hundreds, and eventually settling in Turkey. In a quest to improve the coat of the Persian cat breed, these cats had been bred frequently to Persians. As a result, Angoras died out in all but their native Turkey. Meanwhile, back in Turkey... as with the Turkish Van, this cat breed's native country was diligent in preserving the integrity of this ancient breed. Through a breeding program at the Ankara Zoo, the breed survived. And, just like the Turkish Van, they were reluctant to part with any members of the breed. At one point, Turkey refused to export any Angoras at all, but eventually consented. After World War II, a few pure Turkish Angoras were imported to America and Europe. Today, both the Angora and the Van are rare, and cherished as national treasures in Turkey. The Turkish Angora is an elegant, graceful looking cat. This longhair is known for its luxurious coat. They have a long, muscular body, and a triangular shaped face. They have large, somewhat slanted eyes, and of course a long fluffy tail. This cat may have eyes of any color, sometimes mismatched. They weigh between six to eleven pounds. 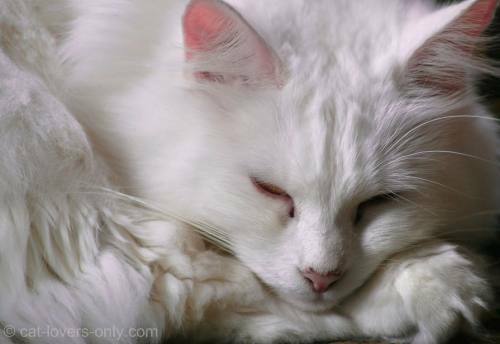 The Turkish Angora cat breed comes in almost every color or pattern, but white is still the most common. Be careful, however, when choosing a show cat. Not all variations are recognized by the various breed organizations. First, check with the breeder you get the cat from for show quality. Second, verify that against the association within which you want to show your cat. If you want a calm, quiet cat breed, then the Turkish Angora is probably not the one for you. These cats tend to be vocal, and love to have nice conversations with their families. While all cats are curious, the Angora tends to be quite the active explorer. Like a Siamese or a Sphynx, these cats can get into quite a bit of trouble if left to their own devices. All of that might be expected from what is one of the most intelligent of cats in world. You should note that the Angora loves to spend time interacting with family members. If you spend much of your day out of the house, however, the Angora can take it. Of course, your cat will find ways to entertain herself without you. Given their playful nature, Angoras have been known to amuse themselves with a ball for hours. They also have a habit of suddenly jumping up to chase imaginary prey. Like most social cats, however, getting her a housemate in the form of another cat would be a good idea. As I always say, two cats are better than one. While not as well known for their swimming ability as the Turkish Van, Angoras have been known to enjoy a dip in the pool. A common problem, of course, with longhair cats is matting and tangling. Surprisingly, this longhair breed's silky coat tends to stay tangle free. Grooming her by combing her hair two to three times a week should be enough to keep it from matting. Groom her more often if you can, as regular grooming helps to reduce the chances of developing hairballs. In addition, she may like the extra attention she receives, and your carpet may thank you as well. These beautiful cats make fantastic pets, and they are very devoted to their owners. If you want a graceful, playful cat with a long, silky coat, then the Turkish Angora may be the perfect cat breed for you.